The last post for my artist residency at Ricklundgården and a sad goodbye to the beautiful gardens and lovely staff! 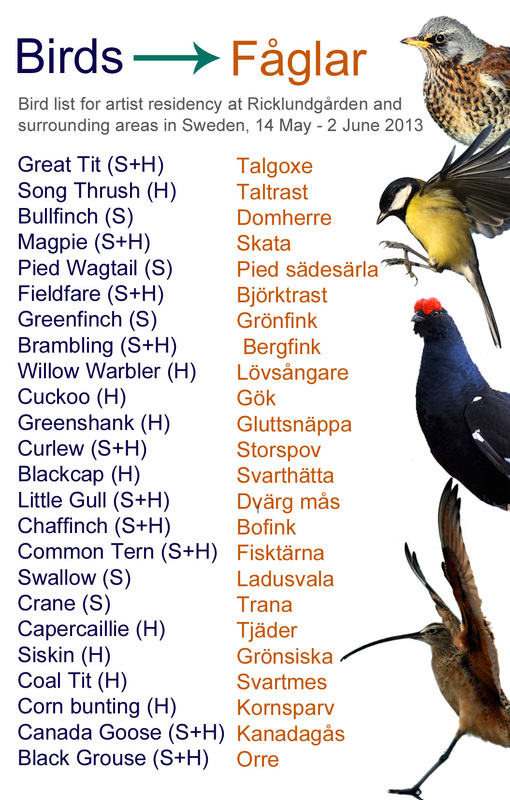 During my stay I have identified 24 birds, visited 4 main locations, and met with 2 birding experts to gather the sound of birdsong. The drawings, prints and installations have been inspired by birdsong, natural objects from the gardens and the rapidly changing weather; from a snow-covered garden and frozen lake one week, to one filled with sprouting flowers and glorious sunshine the next! Finding out where the garden birds have come from and where they will go to next as part of their yearly migration, how to read birdsong on sonograms and just how expensive the food is here! Read more about this at my blog www.drawingbirdsong.wordpress.com, plus my recent reindeer sighting up a mountain, getting tutted at by a Black Grouse and being stuck in the middle of a sing-off between Bramblings!